Last week I had the honor of being with you and sharing a question that’s been at the center of the Arts & Business Council’s most recent work: what we, as arts supporters and champions of Chicago, can do to exemplify and proactively instigate racial equity. As animated and fantastic as the event may have felt, my only hope is that you found something thought-provoking within Xavier Ramey’s message. Something that leads to your own capacity building within the work of racial and cultural equity. Whatever it may be, discuss it with your friends, staff, and colleagues. Make note of your personal practices, create consensus within your offices, and resolve to create a more just Chicago. To love our city is to love every community and neighborhood that belongs to her. As an organization we know that there is no right or perfect way to confront inequity. We also acknowledge our past wrongs and understand that we are not subject-matter experts in this conversation. That said, the Arts & Business Council is willing to take risks and become the accomplice Chicago’s many communities deserve. Why? Because injustice impacts all of us… and there is too much at stake not to take action. 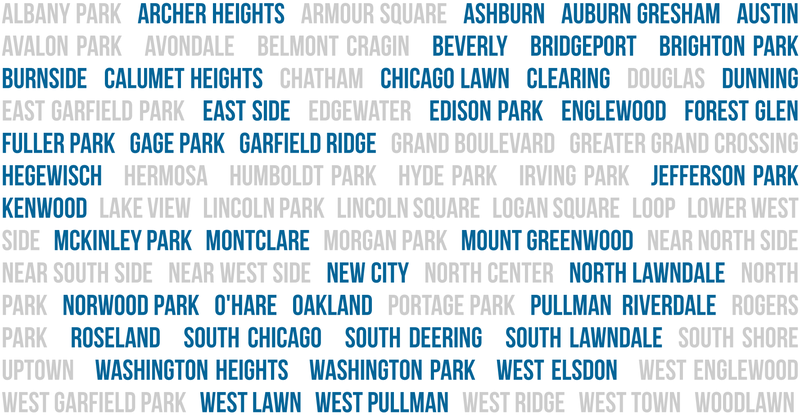 Below is a listing of all 77 Chicago community areas. Communities shown in blue represent those where the Arts & Business Council has not been of service. Help us—both respectfully and authentically—expand our work into those communities. Do you have a project, organization, or community leader in mind? Email Braden Cleary at bcleary@artsbiz-chicago.org and tell us who we should meet! Tell your friends, family, and co-workers about the work of the Arts & Business Council. Encourage them to join as a member, business volunteer, or On BOARD participant. Mark Thursday, July 18 on your calendar and plan on attend Summer Bash, our annual summer gathering. Make a gift and invest in our goal of reaching all 77 communities, by 2020. I feel honored to advance the Arts & Business Council in this new direction and proud of our board’s commitment to racial equity. Again, thank you for being with us. I look forward to taking action with you. P.S. Photos from the luncheon are now available here!